← Mountain Dew Kickstarts the Morning! In today’s health-conscious society, we eat more fruits and vegetables while on the move. But it can be messy when we are on-the-go and trying to get a quick nutritious snack. The food flies everywhere! To solve this messy problem, enter new grown-up packages of pureed fruits and vegetables. Companies that have traditional been focused on baby food – such as Happy Family, Buddy Fruits, and others – are now working on new portion sizes, designs, and flavors for adults, including Greek yogurt and squeezable oatmeal. 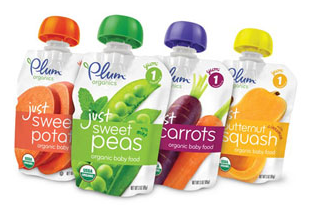 Pouches have seen increased use in the baby foods industry since the pouch helps to extend the lifespan of the product. This is fine for toddlers and kids, but many adults balk at the packaged products. They may eat from pouches in private, but be hesitant to appear juvenile when eating that way in public. After all, in marketing, perception is reality – companies have to manage the perceptions of their products in the hands of an older consumer. Early adopters for the pouches tend to be athletes who already consumer snacks and gel supplements via pouches. This segment can lead the way as the market expands beyond babies and toddlers, and into a more mature market. Smoothie or pureed peas, anyone? Have students research the baby food industry. What are the main companies, size of industry, growth, etc.? How can this industry meet the needs of older consumers? Discuss aspects of branding the baby food companies to be acceptable to older consumers. Are new brands needed? Use the product/market grid to illustrate the strategy of taking a current product into a new market (baby food to adults). What marketing tactics will be needed? View the Web sites for companies such as Gerber Baby Foods, Plum Organics, Happy Family, Buddy Fruits, and GoGo squeeZ. What are the messages and target markets for these companies. How might they expand into new markets?